JBL SRX738 Series Loudspeaker DJParts - All Variety of Parts that DJ Needs. Combining the performance of a subwoofer/satellite system with a single-enclosure ease-of-use, the SRX738 uses a 2268 18" Differential Drive® woofer for world-class low-end performance, even without a sub. 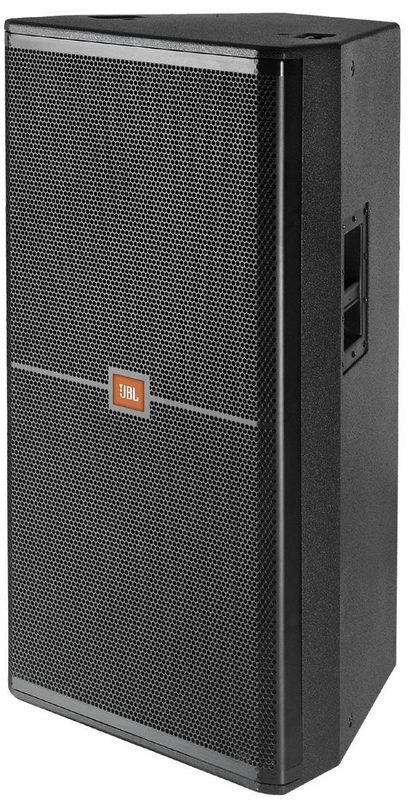 Mids are handled by a 2169 8" driver using JBL's CMCD™ Cone Mid-range Compression Driver™ technology that provides very low midrange distortion, increased sensitivity, extended bandwidth and improved phase coherency. The mid-range driver is mounted to a 60° x 40° waveguide* hosting a 3" (voice coil) 2431 high-frequency driver. Ideally suited to sound reinforcement and music playback use where low-frequency extension, mid-range clarity and projection are critical, mobile DJs and musicians will appreciate the simplicity and performance of the SRX738. Sound companies will also find the SRX738 to be a flexible addition to their arsenals. The SRX738 may be used in full-range or bi-amplified modes with a passive cross-over handling the transition from the mid-range to the high-frequency driver. *Not rotateable in SRX738 enclosure.